I often consider Bruce Springsteen as being the leading light of 'dad-rock' figure - the basis for this being that he is in fact possibly my dad's favourite artist. I have as a result of many hours spent in pubs with Dad and many pennies spent on jukeboxes fostered quite an appreciation for "The Boss" over the years. This year though my appreciation for Springsteen has been rekindled mainly due to the release of We Shall Overcome: The Seeger Sessions. The type of American roots music on the record is very different to his work with the E Street Band and to his solo work but yet the music was still exceptionally Springsteenian - it has the big sound delivered with passion and meaning. On the basis of this album, I decided to give Born in the USA a listen again and found myself thinking how great the songs are - so athemic and so gritty. 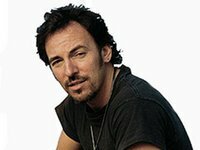 Additionally I downloaded 'The Ghost of Tom Joad', a song about social injustice in 1990s America, and found that Springsteen's stripped-down Americana sound is as much a match for the work he did with the E-Street Band as the work he has done recently with the Seeger Sessions Band. I can't do the music, or Springsteen, any justice by describing them and the emotions they can give you. All I can say is go onto iTunes and look for: Shenandoah and Oh, Mary Don't You Weep (from We Shall Overcome); Born to Run (Born to Run); Born in the USA, Glory Days, My Hometown and Dancing in the Dark (Born in the USA); The Ghost of Tom Joad (The Ghost of Tom Joad); and Streets of Philadelphia (Greatest Hits). I've seen him live three times. Tom I would never of guessed you had such a good sense of profound sound. He only has one thing wrong inmy book - he has short arms!